Get Volunteering! Liberal Judaism’s groundbreaking oral history project Twilight People: Stories of Gender and Faith Beyond the Binary records and showcases for the first time in the UK the stories and experiences of transgender and gender variant people of faith. 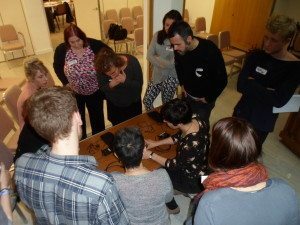 Throughout the project – from 2014-2016 – we had a great number of opportunities for skills-exchange and free training: oral history training, archiving, transcribing, sound/video editing, and many other things. We are sorry, we do not have any current training or volunteer opportunities. We do need people who can take this legacy to the next level, post-funding. Ideas? Let us know via the contact form on this site.